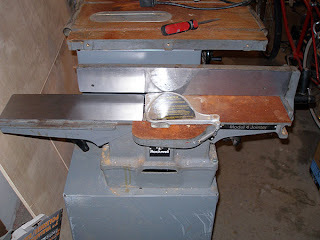 The rust on the horizontal surfaces of my "new" Rockwell combo saw/jointer was worse than I expected. In some places it penetrated pretty deep. I used a 3m Rust Stripper wheel attached to my drill. Working it so the brush marks ran in the same direction as the workpiece will travel, I slowly removed every trace of rust from the iron surface. What I was left with was a brushed steel look. Smooth enough probably, but I wanted it smoother. I started with 220 grit wet or dry paper, lubricated with mineral spirits. I did one pass across the brush marks from the rust removal, and one with the brush marks, rinsing the paper with mineral spirits each direction change. 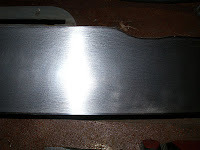 Using that method, I worked up through 400 grit, 800 grit, and finally polished with 2000 grit. The end result was a nearly mirror shine. I was tempted to go one step further and use my buffing wheels but thought that would be too too much. 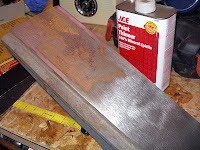 The photo at right shows the texture of the jointer's fence. You can still clearly see the mill marks. 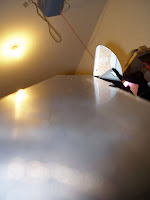 But while they're visible under some conditions, in the next photo you can see just how smooth the surface really is. I only got to the fence and the outfeed wing on the jointer last night, but there was some trial and error involved that I had to work through. I'll finish the infeed side tonight, and this weekend clean up the guts and paint. I recently got a Rockwell model 37-130, black in color. The table was rusty, I cleaned it up pretty good with a file. Apparently, it had been cleaned before with some circular power tool that left it with some circular valleys. But the blades need sharping, I was told I need a special tool to align the blades after they are sharpened and re-mounted. Is that so, and where do I get such a tool? I'll document the super simple way to align the table and knives soon.